CNRS's Institute for Engineering and Systems Sciences (INSIS) brings together fundamental research, engineering and technology, emphasizing a naturally integrative systems approach stemming from the scientific disciplines encompassed by the Institute. From understanding phenomena to thinking up systems of major technological and societal importance, and from designing such systems to developing basic concepts and technologies, engineering and systems sciences lie at the heart of tomorrow's technologies. micro- and nanoelectronics; micro- and nanotechnologies; micro- and nanosystems; electromagnetism; electrical engineering; photonics. Interdisciplinarity lies at the heart of INSIS, both in-house regarding its own disciplines, and with other institutions. In addition, INSIS conducts strategic actions in partnership with industry, other research institutions, and local and regional authorities. It is closely involved in structures such as competitiveness clusters and the Carnot Institutes. 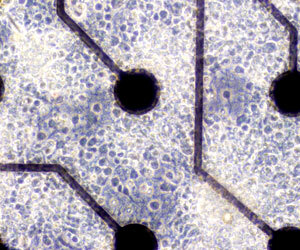 Culture of primary neurons from embryonic rat cortical cells on a micro-electrode array (Laboratoire de l'intégration du matériau au système, Talence). energy, which represents a major challenge for our society. This is an extensive area of research at CNRS. INSIS, CNRS's representative institute within the French National Alliance for the Coordination of Energy Research (ANCRE), concentrates on this field, which involves a large number of its laboratories and Research Federations, such as the Institut Photovoltaïque d'Île-de-France (IPVF), the International Thermonuclear Experimental Reactor (ITER), the Fédération de Recherche sur l'Énergie Solaire (FEDESOL), etc. the French National Network of Large Technological Facilities for Basic Technological Research (RENATECH and its 7,000 m² of clean rooms for research into micro- and nanotechnologies). Research at INSIS has strong international repercussions, and the Institute is involved in collaborations with more than twenty countries from every continent. These partnerships range from the straightforward exchange of researchers to the setting up and support of international joint units in France and abroad. 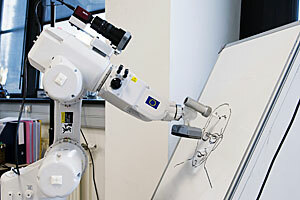 An artist robot converts a digital photograph it has previously taken into a portrait (Institut P', Futuroscope-Poitiers).